Currently you can get a printed tote bag as gift with Purchase in the Carrefour in China. 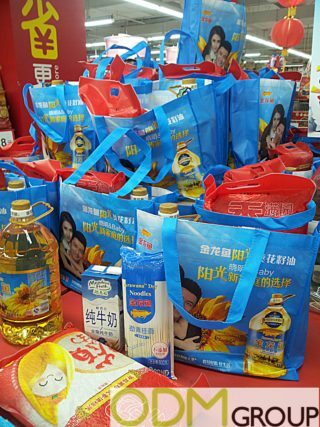 By buying this package of rice, oil and noodles you will get a printed tote bag for free. These kind of promotional products are often used in Supermarkets, which makes a lot of sense because of its practical reasons. This Tote Bag is perfect to carry your groceries back home from the supermarket and is very Eco-friendly as you can use it multiple times. Its full size printing will gain the recognition and a lot of attention to your brand. The colors of this full size printing are pantone matched to the color of the product. This Tote Bag is customize-able to any brand, company or campaign you like. Why should you think about a Printed Tote Bag? Boost Sales. To have a full size printing on these Tote Bags will generate a long-term attention to your company, which will pay out in your sales. Custom. A printed tote bag can easily be branded and customized to your logo and campaign. This is a great way to pay a positive affect to your brand awareness. Customer satisfaction. To provide a bag while shopping groceries is very clever as this will help the customers to transport these products to their home, which will pay a positive affect to your image and will gain the attention to your brand and company for a long time and not just during this campaign. At ODM we have significant experience in product design, sourcing and manufacturing. We can help you with your marketing budgets effectively. Be sure to contact us if you are interested in finding out more information about printed tote bags. Please also have a look on Tote Bag related links below.